This blush floral wedding invitation is a guaranteed guest favorite. Combining watercolor florals with an elegant blush and gold palette–it's the perfect start to your big day. Set the table with these glam menus! Complete your blush gold wedding decor. Ever after starts here–our blush blossom invitation suite sets the tone for a spring wedding. Cue the confetti! 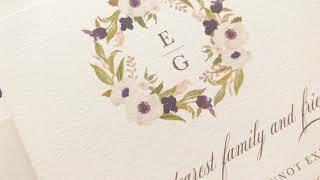 Your wedding begins with this marsala wedding invitation suite. Click through to shop now! These are for you! Our favor tags and labels have been highly requested by brides over the last two years, and now they're officially added to our lineup in the shop. Click through to shop now. Pin now to your fall wedding board! This save the date is super popular for our September brides. Styled with navy envelopes for that extra pop of color. You're going to want to see this if you're planning a fall wedding... The color palette is perfection for September brides! Let these watercolor blush floral wedding invitations set the tone for your big day! Our hand painted stationery is designed to impress. Blush and navy is such a popular wedding palette, and I'm so happy to say this invitation suite got a sweet update for the new year. Take a closer look! Spring brides are showing so much love to this new invitation suite! Blush, gold, and hints of dusty blue–this palette is perfect for a warm-weather wedding. Complete your tablescape with wedding menus! Currently 10% off all orders over $75. (Photo courtesy of Mint Photography, @lovemintphotography on Instagram). The perfect way to honor a jet-setting bride, you'll love these travel themed bridal shower invites! Plus? Get 10% OFF all orders over $75. Add a little something extra to your wedding decor with these floral place cards, currently 10% off. Blush and marsala–this popular palette never gets old! Currently offering 10% off now thru Sep. 20. Say yes to a wedding in paradise! These botanical invites certainly set the tone. Beautiful signs to compliment your decor! Only $5 each. Your wedding starts here–timeless boho paper goods from Betty Lu Paperie. Your quest for stationery that captures the essence of your bohemian wedding is over. In a timeless color palette of marsala, blush and plum, this invitation suite is perfect for boho brides. Boho brides rejoice–this southwestern inspired stationery is both chic and purposeful. Designed in a timeless blush and gold palette, it completely captures the essence of your bohemian affair.